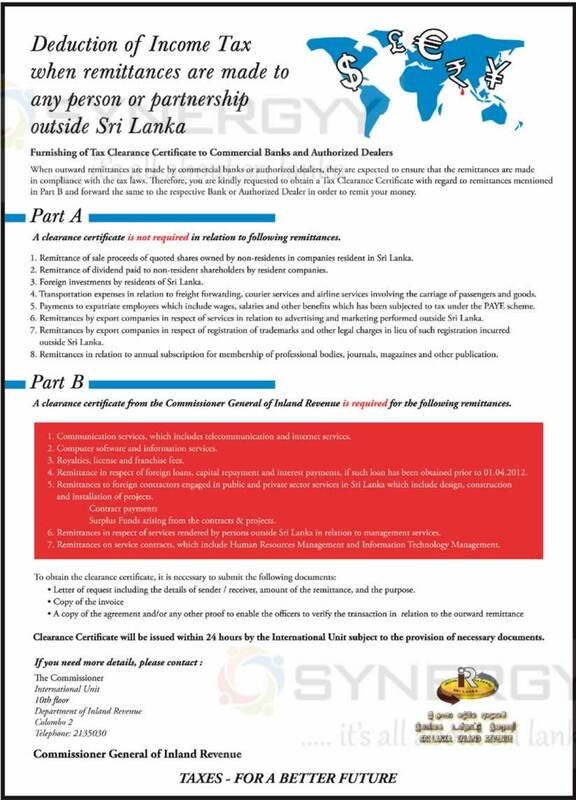 The Applications are called from 20th May 2014 to 20th June 2014 from all the school and private candidates who intend to sit the above examination. The Specimen Application Form given below attachment is only for the private candidates. Every private candidate should read and understand this notice completely and complete the Application Form. A special consideration should be given to write the accurate number when mentioning the town number and subject numbers in the Application. The relevant application forms have been sent in order to receive by 20th May 2014 to the government schools and approved pirivenas in which the students have sat the G.C.E. (O/L) Examination before. If any school has not received the applications by now such schools should inform the School Examinations Organization Branch immediately. Only those who have left school can apply as private candidates . Any one applying for this examination as a private candidate while still being in school is illegal. If such an instance is revealed, it will result in being debarred from sitting examinations. Any person not attending any state school, non fee-levying approved school or recognized Pirivena may sit as a private candidate. 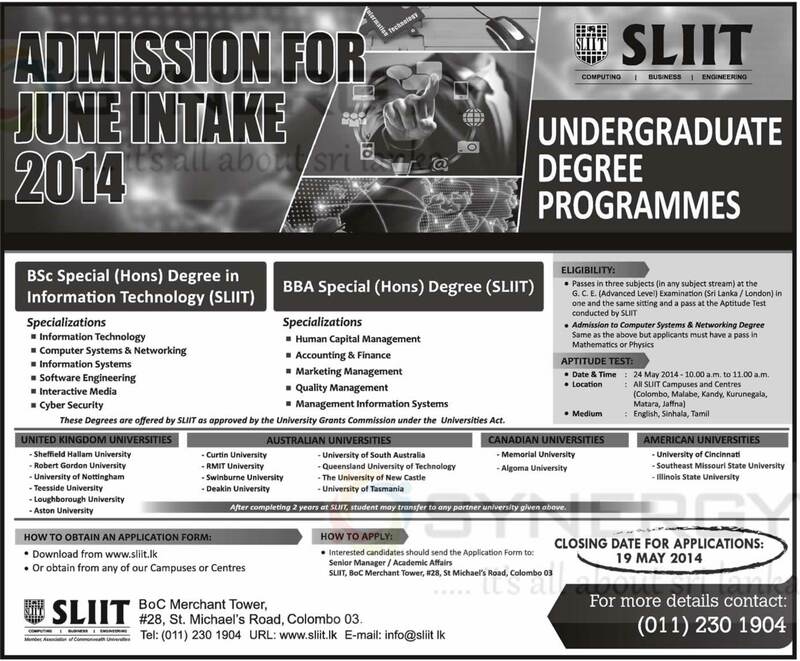 Applications for this examination will be received from private candidates only up to 20th June 2014. Private candidates should select the town closest to their permanent residence for the examination. Application Forms should be prepared by candidates themselves in accordance with the Specimen Application Form appearing on below attachment. The Application Form should be 28cm x 21cm in size and cages 01-12 should be on the first page while the cages 13-14 should be on the reverse. The application form sent by you should be in accordance with the specimen application form. One Candidate should submit only one Application. If any candidate sends more than one application his candidature will be cancelled / results even though released, will be annulled. They also can be subjected to a long term suspension from the examination. Furthermore one envelope should contain only one application. Applications should be completed correctly and clearly in one’s own handwriting and for that matter given instructions should be followed thoroughly. When using application forms prepared by outsiders, carefully check whether the subject numbers, town numbers and all the other details are in compliance with those given in this notice. The Department will hold no responsibility for any mis-prints in respect of the structure of the application form, subject lists, town numbers etc. It is the responsibility of the candidates to prepare their applications in compliance with the specimen given in this notification which is the official notification of the Department of Examinations. All private candidates must pay the prescribed fees, relevant to the number of subjects they wish to appear for. Examination Fees paid will not be refunded in full or partially or transferred as fees for any other Examination. After submitting the applications, the private candidates will not be allowed to change the examination centre, medium of language, subjects under any circumstances. 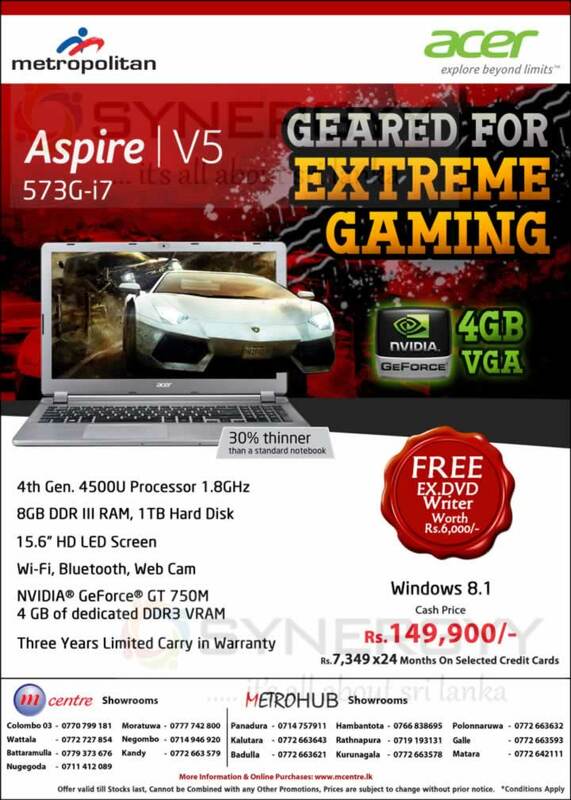 Hence special attention will have to be paid on the above when completing the application. Applications for which examination fees have been paid to post offices after the closing date of applications and applications received after the closing date will be rejected. The applicants who apply for the following subjects in Section II should sit for a practical test. Final results will be released only for the candidates who sit for both written and practical examinations. The Shangri-La hotel chain, which will be initiating Sri Lanka’s first seven star hotel, has revised its plan of construction and has decided to increase their investment to US $450 million, excluding the cost of the land and along with an increase of rooms from the initial 500 to 625. The hotel is to be built on 10 acres of land overlooking the Galle Face Green. The land was initially bought in 2010 with a price tag of US $ 125 million and the approval for the construction was received in the same year. With the increase of rooms and a newer plan already paving the way for the new building, the deadline has also gone up, with hopes for the project to see completion in 2017, though the preliminary plan was to finish the project in 2015. The proposal for the new project has already been approved and the tax concessions will remain the same. With the project seeing fruition, the Electricity Board (CEB) will also have to shift one of their high-tension cables which is getting in the way of the construction and therefore, there are discussions underway between the relevant authorities with regard to this. Shangri-Ia Colombo will comprise of a sushi bar, steakhouse, seafood market and Irish pub, specialty restaurants with Indian, Islamic, Szechuan and Macanese cuisines, a Sky lounge, meeting facilities, a swimming pool, spa and tennis courts. In addition to this, Shangri-La’s Hambantota Resort and Spa, which is also in the pipeline, is set to include an 18-hole golf course and is set to offer 315 rooms, including 24 suites. 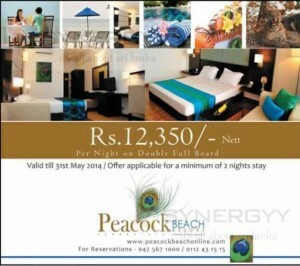 Hambantota Resort and Spa will also comprise of a Sanctuary. Shangri-La Hotels and Resorts is a Hong Kong based company and five star properties are located across Asia, the Middle East, North America, Oceania and Europe. The first hotel of the group was the Shangri-La Hotel Singapore and this opened in 1971. The chain is the largest Asian-based luxury hotel group in the region and is regarded as one of the world’s finest hotel management companies. In some parts of the country, availability and quality of drinking water is reducing at an unprecedented pace due to various factors. Most of these areas are also stricken by poverty causing people more vulnerable. Although many other drinking water options are available, year round availability and quality is a question. Therefore, Rain Water Harvesting can be a good option to supply safe drinking water for households throughout the year. The problem is how poor can afford to have their own rainwater harvesting system as the initial cost of present rain water harvesting systems (Material & Labour) has become high. 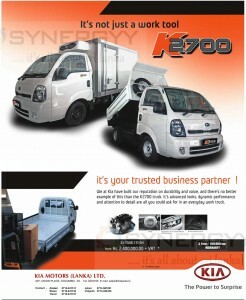 Can you think of a design to help the society to resolve this problem? Do you have ideas of rainwater harvesting methods I techniques? 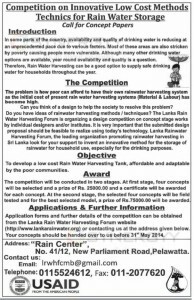 The Lanka Rain Water Harvesting Forum is organizing a design competition on concept stage works by individual designers and/or institutes. It is very important that the submitted design proposal should be feasible to realize using today’s technology. Lanka Rainwater Harvesting Forum, the leading organization promoting rainwater harvesting in Sri Lanka look for your support to invent an innovative method for the storage of rainwater for household use, especially for the drinking purposes. To develop a low cost Rain Water Harvesting Tank, affordable and adaptable by the poor communities. 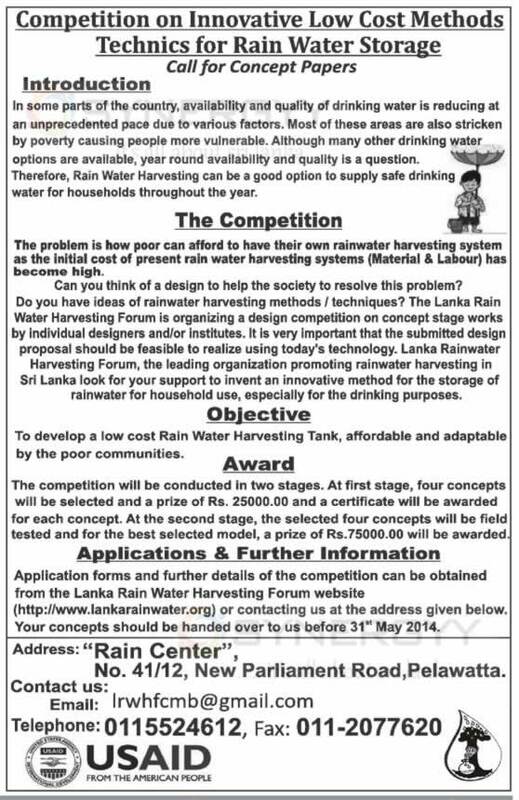 Application forms and further details of the competition can be obtained from the Lanka Rain Water Harvesting Forum website http://www.lankarainwater.org or contacting us at the address given below. 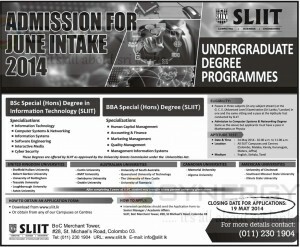 Your concepts should be handed over to us before 31st May 2014. 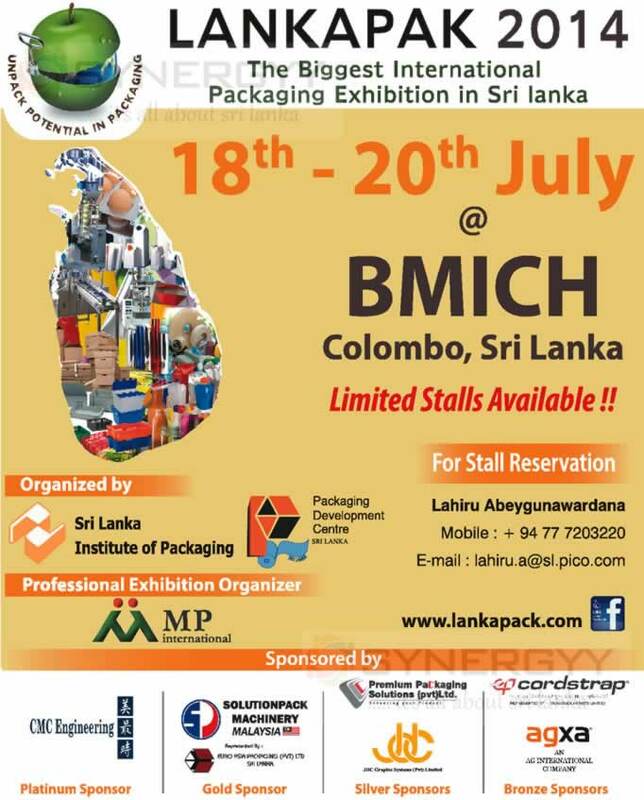 The Srilanka Institute of Packing organised an exhibition of Lanka Pak 2014 from 18th to 20th July 2014 at BMICH Colombo, Srilanka. 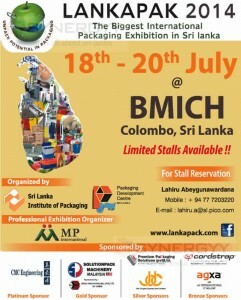 The Exhibition will be an ultimate solution for your packaging needs for your product to be a rich looks. 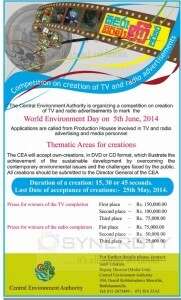 The Central Environment Authority is organizing a competition on creation of TV and radio advertisements to mark the World Environment Day on 5th June, 2014, Applications are called from Production Houses involved in TV and radio advertising and media personnel. The CEA will accept own-creations, in DVD or CD format, which illustrate the achievement of the sustainable development by overcoming the contemporary environmental issues and the challenges faced by the public. All creations should be submitted to the Director General of the CEA. Duration of a creation should be 15, 30 or 45 seconds, last date of acceptance of creation will be on 25th May 2014. Kandy Nursing Horne has successfully ventured into Kidney transplant with a reputed kidney transplant surgeon and a team of competent medical and para medical staff according to International standards with medically accepted donors provided by the patients. Today many transplants have been successfully performed by this team with much success at a moderate cost to the patient and post operative complications have been minimal. The patient can recuperate in a quiet environment and qualified nursing care. The Kandy Nursing Home is the first Private Medical Institute established in Kandy in 1947. This institution today is the only Private Hospital outside Colombo that is performing Kidney Transplant Surgery with government approvals. 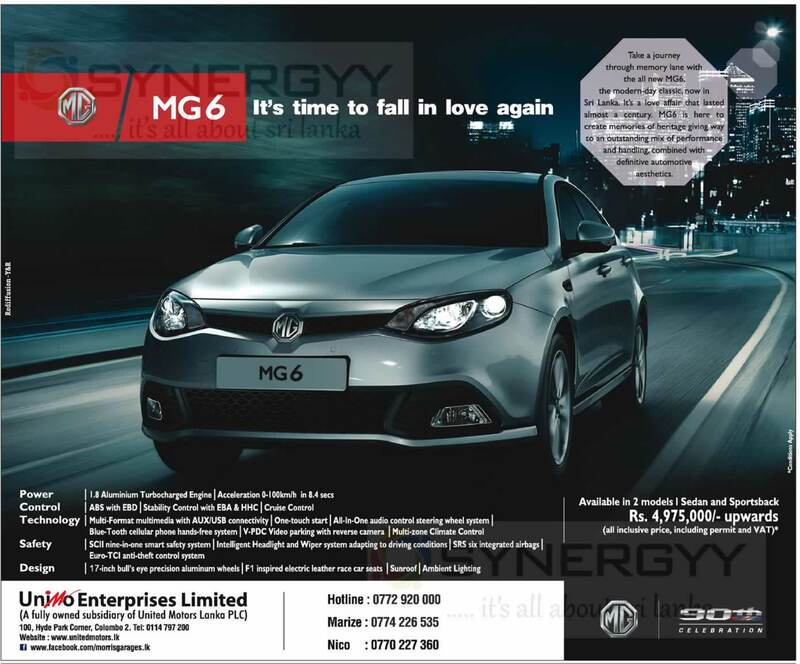 For the first time in Sri Lanka, MLM Associates will be designing and constructing an ice skating rink in conjunction with the cable car project which was set to be erected in Nuwara Eliya between Lake Gregory and Mahagastota. 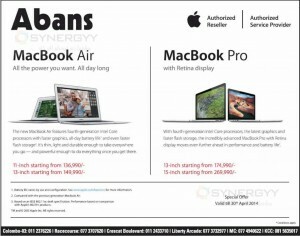 The entire project will be – completed at a total investment of US $25 million. The cable car project was due to be completed in April this year but due to difficulties and a lack of support from the Forest Department in the clearing of lands for the construction of permanent structures, the project had to go through a complete redesign. Due to the redesign of the project and plans to introduce the ice rink along with a gym and a hot water swimming pool, the company was able to bring down the return ticket price from Rs. 1000 to Rs. 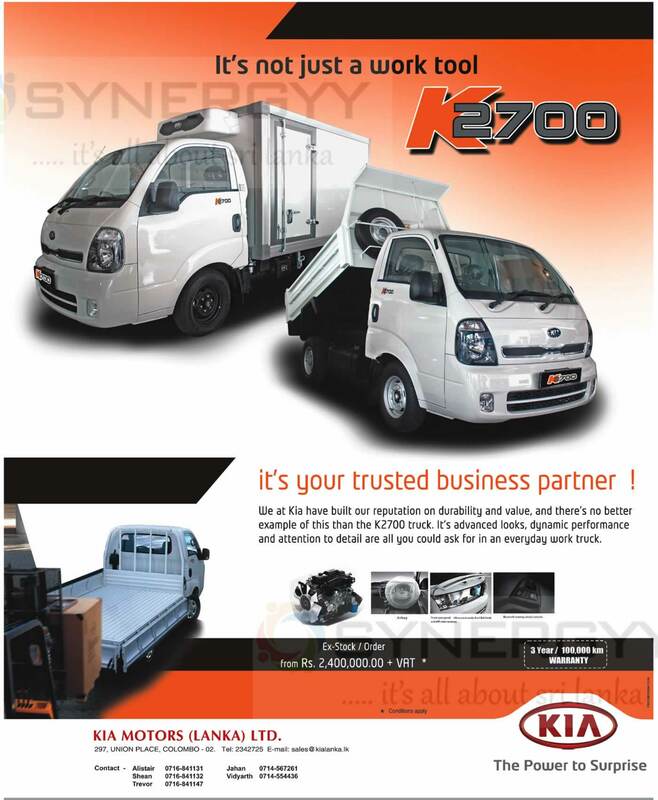 700. We are awaiting the clearance of land in single Tree Mountain to be approved within the next two months in order to be able to work on the permanent structures as the project will also include a luxury’ hotel. We are currently under discussions with the Land Reforms Commission (LRC) in this regard. With the cable cars, the installation and operation will hopefully be completed by April 2015. The project is being segmented into three phases that would extend to nearly 7.5 km, with the first phase pulling out from Lake Gregory to Single Tree Mountain with an investment of USD nine million alone. The cable cars would be dual powered; solar and wind and each cabin would have the capacity for 15 persons. Over 750,000 visitors travel to Nuwara Eliya each year and there is hope of attracting 70% of these travellers and holidaymakers for rides on the Cable car. Launch stocks of the Samsung Gear Fit wearable fitness tracker are said to have sold out. with a reported 250,000 units being shifted in just 10 days of launched. With the wrist-mounted Samsung Gear Fit having launched alongside the flagship Samsung Galaxy S5 smartphone earlier this month, latest reports out have claimed all 250,000 Fits available on day one have now been shifted. Going head-to-head with the likes of the Nike Fuel-Band SE and Jawbone UP24, the Samsung Gear Fit acts a fitness and wellbeing tracker, with an inbuilt heart rate sensor featuring alongside the device’s steps, distance and calorie burn tracking credentials. 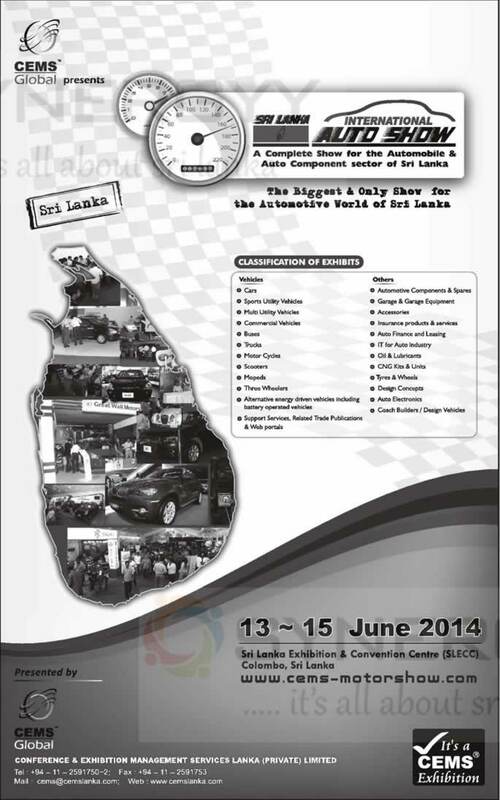 Conference & Exhibition Management service Lanka (Pvt) Ltd organised a International Automobile show at SLECC from 13th to 15th June 2014. The Peacock Beach Resorts announces a special promotion till 31st May 2014 as enjoy southern coastal area for Rs. 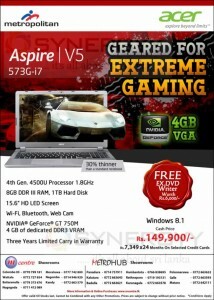 12,350.00 per night for double full board basis. 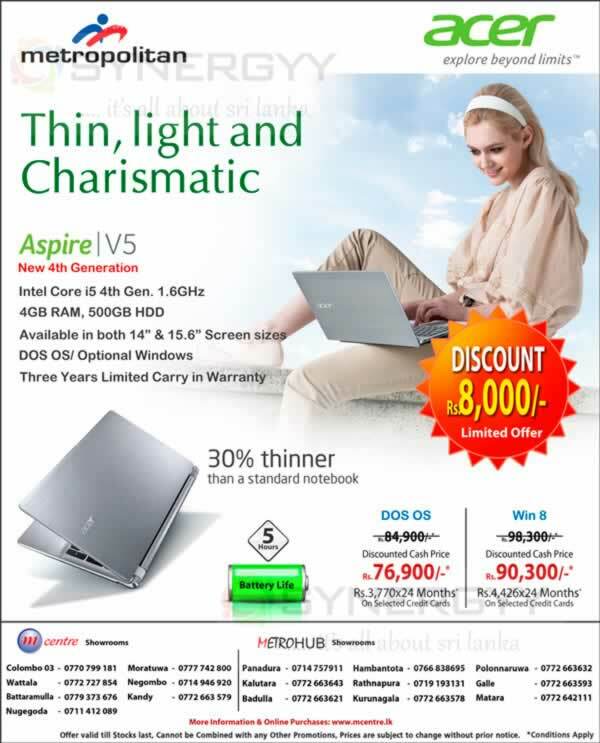 The Offer applicable for a minimum of 2 nights stay. 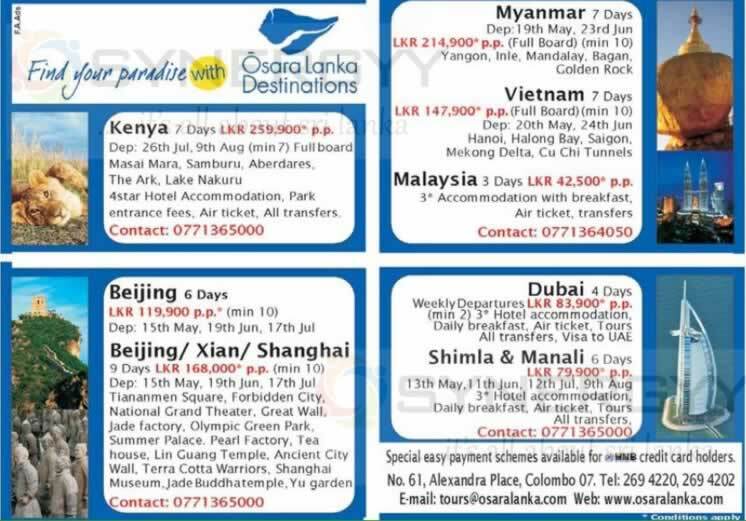 The Osara Lanka offers a range of tour packages for Srilankan for their vocation period and have a great holidays in Wild life, Adventure, Tracking and shopping experience. 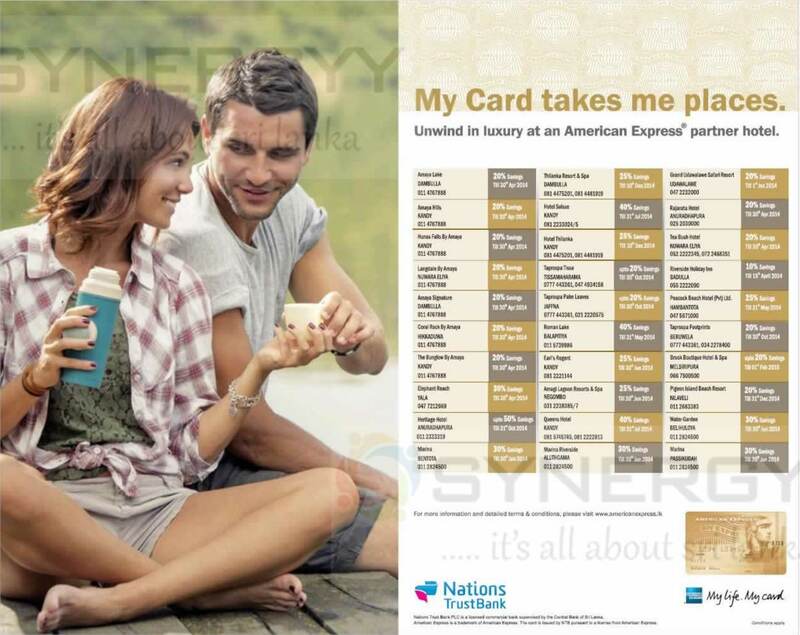 Special easy payment schemes available for HNB credit card holders. No. 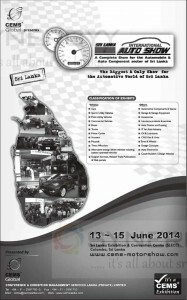 61, Alexandra Place, Colombo 07. 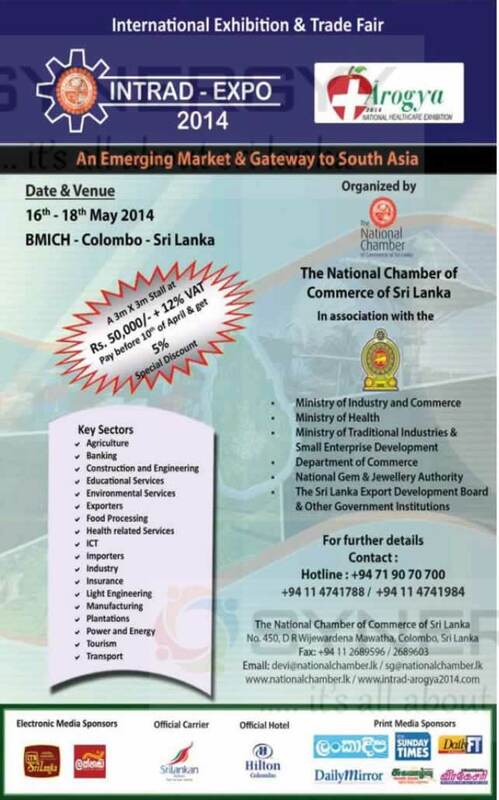 The National Chamber of Commerce of Srilanka has organised an International Exhibition & Trade Fair of Arogya 2014 on 16th to 18th May 2014 at BMICH, Colombo Srilanka. 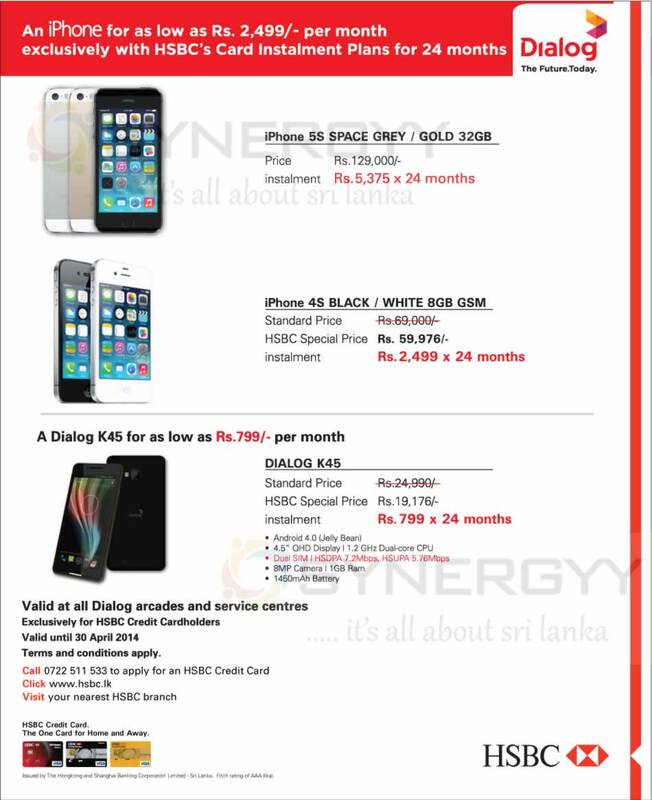 HSBC Srilanka offers great deals for Apple iPhone 5S and 4S at a best price in Srilanka, the offers are as low as Rs. 2,499/- per month exclusively with HSBC’s Card Instalment Plans for 24 months. Enjoy Rs. 129,000.00 worth of Apple iPhone 5S for Rs. 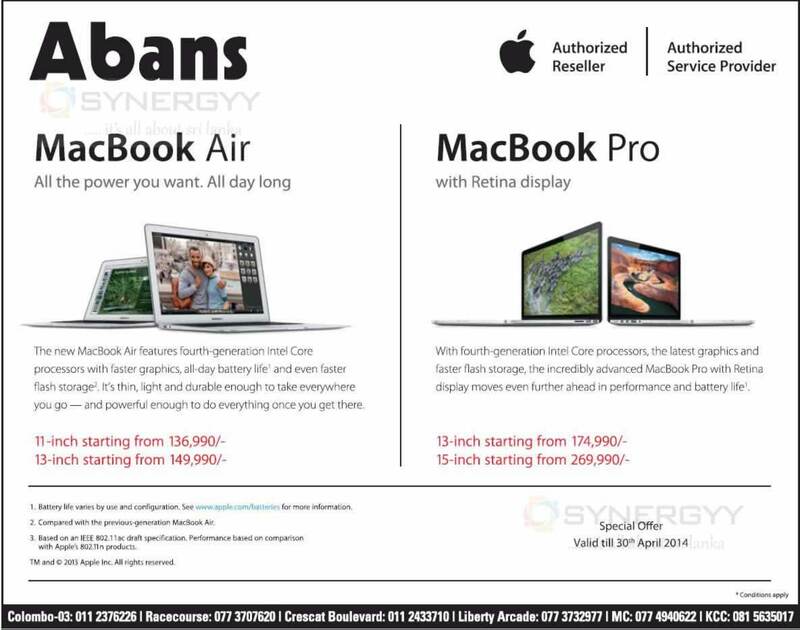 5,375.00 for 24 months on HSBC Credit Card Space Grey / Gold 32GB. 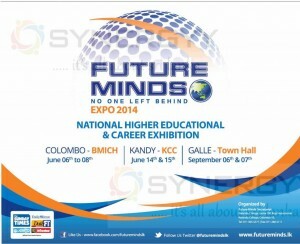 Nalanda College Junior Old boys associations future minds secretariat organised a Future Mind High educational & Career Exhibition at Colombo, Kandy and Galle. The Lotus Tower that Is being constructed down D.R. 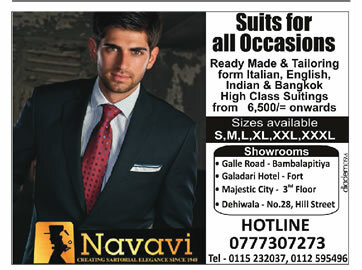 Wijewardene Mawatha has reached a height of 50 metres now. The telecommunication regulatory official stated that feasibility studies for the second, phase of the project are ongoing with the finalisations to structural drawings. It will take another one or two months for the feasibility studies to be completed. Once that is done, the papers will be submitted to the Cabinet for approval. The second phase of the project will have a massive car park and shopping mall and is being designed by the University of Moratuwa. The first phase of the project that the ongoing construction is being funded by a loan obtained from a Chinese bank. With communication towers, museums, food courts and administrative offices, the tower would be a communication hub for both public and private sectors. The Lotus Tower will stand 350 metres in height and will be the tallest building in the country once completed. Authority (UDA) is to begin constructing seven new housing schemes in Colombo for low- income earners. The authority said its target was 10,000 housing units under the new phase which is scheduled to be completed within 18 months. The project at Applewatta, Maligawatta, Aluth Mawatha in Mattakkuliya Madampitiya. Kimbulala, Bloemendhal and Torrington have been given to local construction companies such as MAGA, Tudawe Brothers, Access, Sierra, State Engineering Corporation, Sanken and CML MTD. UDA official stated four new housing schemes are to be completed at Aluth Mawatha. Mattakkuliya and one each at the other sites. The houses are being built on plots of land that have been released after a number of low-income earners were resettled in recently completed government housing schemes. 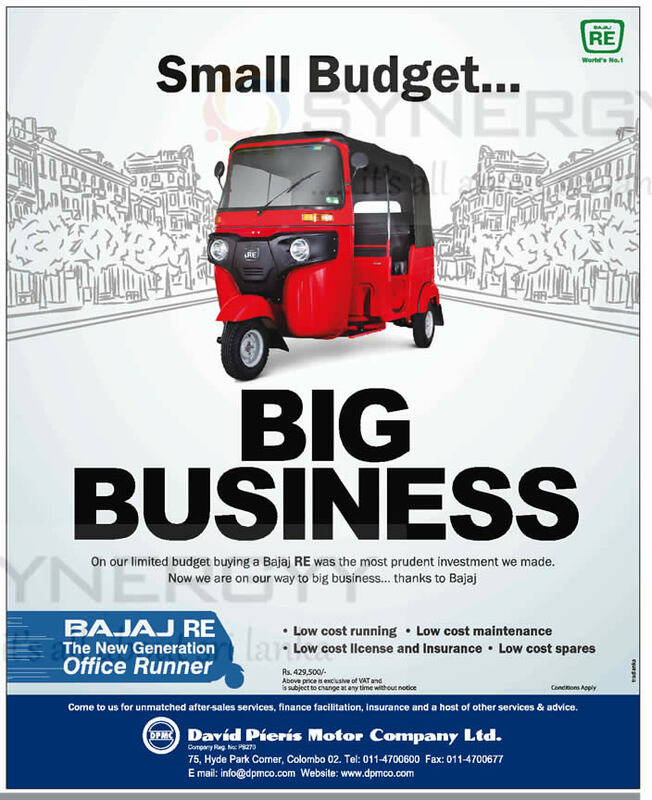 Further stated that while the construction cost of one unit would be Rs. 3.5 million the complete cost of a housing unit including the cost of equipment electricity and a water supply would cost the authority Rs. 6.8 million each. The families relocated in these schemes would have to make an initial payment of Rs. 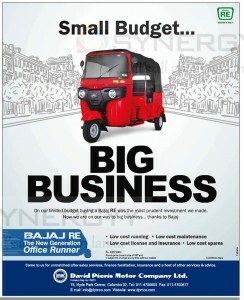 50,000 and Rs.3,000 each to cover the cost of construction. The UDA has a target of constructing 30,000 housing units by 2015. Constructing housing schemes around the city have been a part of a large scale Colombo redevelopment plan. The project looks into issues such as flooding, garbage, the lack of open spaces and usable pavements. We have already resolved most of & them. Housing for low-income earners is the only one remaining to be resolved. The UDA said that studies showed that there were 68,812 low-income houses in Colombo. “40,000 of them are not fit for living. We started constructing 14,000 housing units in 2011 and the construction of 10,000 is to began, We hope to complete 30,000 units by 2015.